This is a full set of 50 decals that feature 19 iconic Star Wars characters including Darth Vader, Luke Skywalker, Yoda, Obi-Wan Kenobe, Han Solo, Slave Leia, Padme Amidala, Chewbacca, R2-D2, C3PO and others. 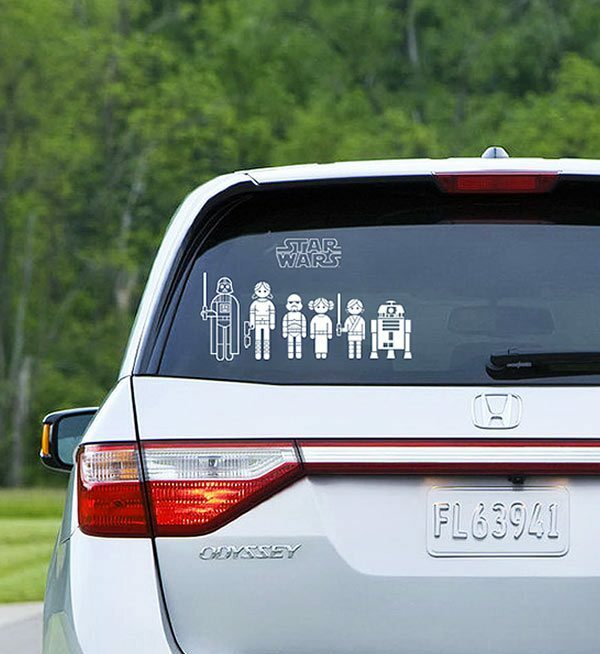 Show the force is string in your family by putting them on your car. You can show dad as Han Solo and Princess Leia as mom, with Luke Skywalker and Little Leia as the kids. If you have a grumpy old grandpa, throw him in as Yoda.